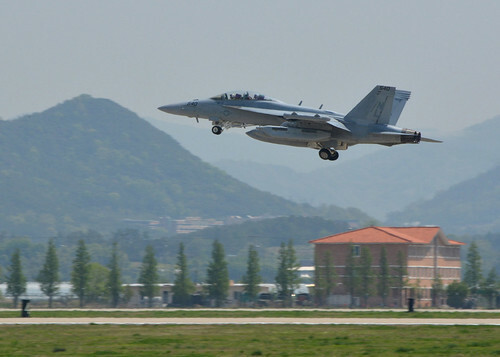 GWANGJU AIR BASE, Republic of Korea - The U.S. Navy's Electronic Attack Squadron (VAQ) 132 participated in Max Thunder, a combined aerial training exercise for U.S. and Republic of Korea (ROK) military aircrews and maintainers that began April 11. Exercise Max Thunder is conducted annually and aimed at enhancing bilateral air-combat capabilities that increase operational readiness and strengthen the U.S. and ROK alliance. The inaugural addition of the EA-18G Growler from VAQ-132 represented an historic first for Max Thunder, an exercise conducted primarily with U.S. and ROK Air Force assets. "This is the first time a U.S. Navy squadron has participated in Exercise Max Thunder," said Cmdr. William McCombs, commanding officer of VAQ-132. "This exercise has been useful for our pilots and crews because we are rehearsing realistic training scenarios. It helps us create muscle memory for what we need to do, while underlining our logistics and tactics." Aircrews from VAQ 132 flew 60 sorties during Max Thunder, operating with their U.S. and ROK Air Force counterparts. Exercise missions were comprised of flight formations, air warfare drills, and tactical maneuvers. "We've learned how to work efficiently with our Korean partners, and I think we've proven to ourselves that we can operate and do very well in this environment," said McCombs. "I'm very proud of the performance of the men and women of VAQ-132 while here in Korea." VAQ-132 is currently on a routine deployment in support of U.S. Seventh Fleet operations in the Indo-Asia-Pacific. The squadron is homeported at Naval Air Station Whidbey Island in Oak Harbor, Wash. Exercise Max Thunder is part of a continuous exercise program to enhance interoperability between U.S. and ROK forces and is not tied to any real-world or specific threats. These exercises highlight the longstanding military partnership, commitment, and enduring friendship between the two nations, help ensure peace and security on the Korean Peninsula, and reaffirm the U.S. commitment to stability in Asia.